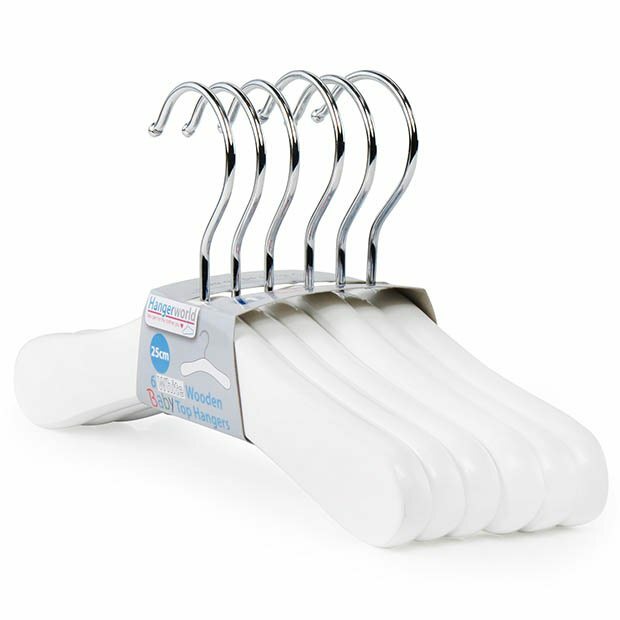 Children’s wooden top hangers, made from long-lasting hard maple wood, with a brilliant white finish for a stylish, contemporary appearance. A smooth surface prevents your children’s clothes from being snagged, which causes loose threads and quickens garment deterioration. Completed with a 360°, polished chrome swivel hook that allows you to position the hanger in any direction and neatly align clothes. Ideal size for hanging baby & infant clothes. Suitable for hanging tops, jackets, coats, baby-grows, and dresses etc. Size: Width 25cm (9.8") approx. The coat hangers are just what I was looking for. They arrived the day after I ordered them and the postage was free - a very good service.